Sapphires and Diamonds make for a stunning combination. 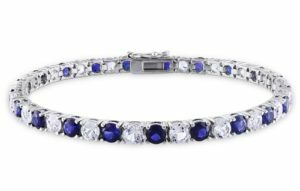 Just like Diamonds, Sapphires have been traced back to ancient times to signify royalty. Sapphires are the second hardest natural gemstone, only surpassed by a Diamond. Their amazing durability, brilliance, and neutral color makes them a great choice for engagement rings and other everyday jewelry. Traditionally, sapphire symbolizes nobility, truth, sincerity, and faithfulness. It has decorated the robes of royalty and clergy members for centuries. Its extraordinary color is the standard against which other blue gems – from topaz to tanzanite – are measured. 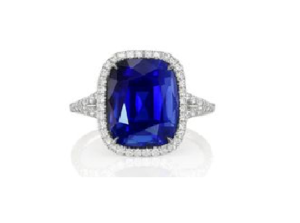 In folklore, history, art, and consumer awareness, sapphire has always been associated with the color blue. Its name comes from the Greek word sappheiros, which probably referred to lapis lazuli. Most jewelry customers think all sapphires are blue, and when gem and jewelry professionals use the word “sapphire” alone, they normally mean “blue sapphire” In reality, pink and yellow sapphires are magnificently popular around the world as well. A special orangy pink sapphire color is called padparadscha, which means “lotus flower” in Sinhalese, the language spoken in Sri Lanka. Stones from Sri Lanka were initially the only ones labeled with this marketable name. There’s no telling how many padparadschas have been sifted from Sri Lankan river gravel throughout history. Sri Lankans have a special affection for the color that’s traditionally been linked with their country. Sapphires (and Rubies) are the hardest gemstones in the world with the exception of diamonds. 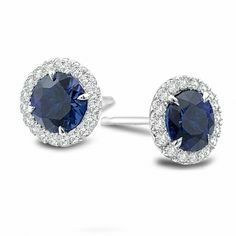 This, along with the fact that blue sapphires blend well with all clothing and accessories, make them ideal for Engagement Rings. 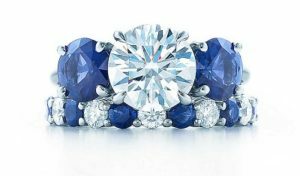 NYC Wholesale Diamonds carries a complete selection of Diamond and Sapphire Engagement Rings, Wedding Bands, Earrings, Necklaces, and Tennis Bracelets.